Our Emerald Flower Garden Stools are multi-functional and beautiful as they are decorative! These versatile metal garden stool can also be used as accent tables, as an ottoman., or as extra seating when unexpected guests arrive. Flip them upside down and use them hidden storage or as planters! 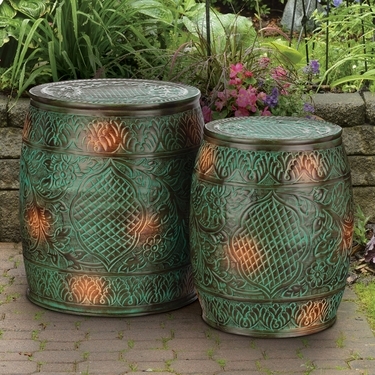 The detailed pattern of this attractive stool set is hammered into a hand-turned metal barrel. The hand-painted multi-color patina finish is weather-resistant for use indoors or in any outdoor setting. Sold as a nesting pair. Sizes: 16" x 19"H and 14" x 17"H. Each holds up to 200 lbs.